Summertime is right around the corner. And that means BBQs! Hey now, don’t be sad or feel left out. Just because we’re vegan doesn’t mean we can’t enjoy BBQs too. Oh heck no. 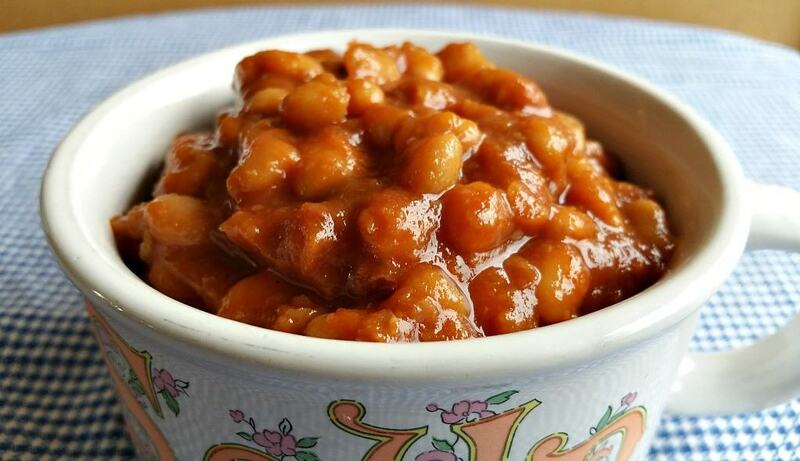 As a matter of fact, with THIS recipe for Vegan Baked Beans, you may well be the STAR of the party. Yep, they’re that good, even without the bacon. Fair warning, this is not one of those ‘quick’ bean recipes. Nope. This is one that will take all. day. long. But believe me, the wait is worth it. Melt in your mouth BBQ beans are SO worth waiting for. And the SMELL as they are slow cooking? Daaaaang. Start with 3 cups of dried, white beans. I used Great Northern. Give them a nice long bath in a few inches of water for the night and forget about them. Next morning, drain and rinse. Be sure and pick out any weird-looking beans or twigs or whatever. Now let’s put them back in the pot with a few more inches of clean water and bring them to a boil. Once they start bubbling, turn off the heat and let them sit and rest for about 30 minutes. Yep, I did both the ‘overnight soak’ method AND the ‘quick soak’ method. Both. Trust me, they will be very tender when we’re all through. After 30 minutes, drain the beans again, but save about 2 cups of the bean juice. Give them a good rinsing and plop them back into the pot. Add that bean juice back in with them along with the onion, garlic, peppers, salt, and veggie broth and bring the pot to another boil. Now once they start bubbling, turn the heat down low and let them simmer for 1 hour. The thing is, the acidity of the tomatoes can make your beans tough. So by cooking them without any of the sauce ingredients first, we really give them a chance to become nice and tender. Now, after the hour is up, carefully transfer the contents of the pot to a crock pot and add the rest of the ingredients. Add the lid and turn the switch to LOW. After about 4 hours if it looks like there’s still a ton of liquid, take off the lid and let them keep simmering. The longer you can wait the thicker they’ll become. Torture? Maybe. But worth it? Oh yeah. These beans are literally the bomb. I gave my wife a taste last night after they had been simmering all day and her only words she could mutter were…… MMMMMMmmmmmmmmm. A thumbs up from the wife usually means a keeper. Never be afraid of a BBQ again. With these beans, some Vegan Potato Salad, and Jeff Novick’s Bean Burgers you’ll be the most popular (and healthiest) person at the BBQ. 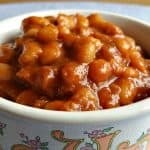 Slow cooked, BBQ Vegan Baked Beans - from scratch. It's an all day process, but oh - the flavor is out of this world. You'll be the star of the cookout. Who says Vegan's can't go to BBQs! Can I make these ahead of time and reheat in crockpot? I’ve made these beans three times now. Followed reciepe but used a dutch oven. They’re amazing. Thank you! This looks yummy! 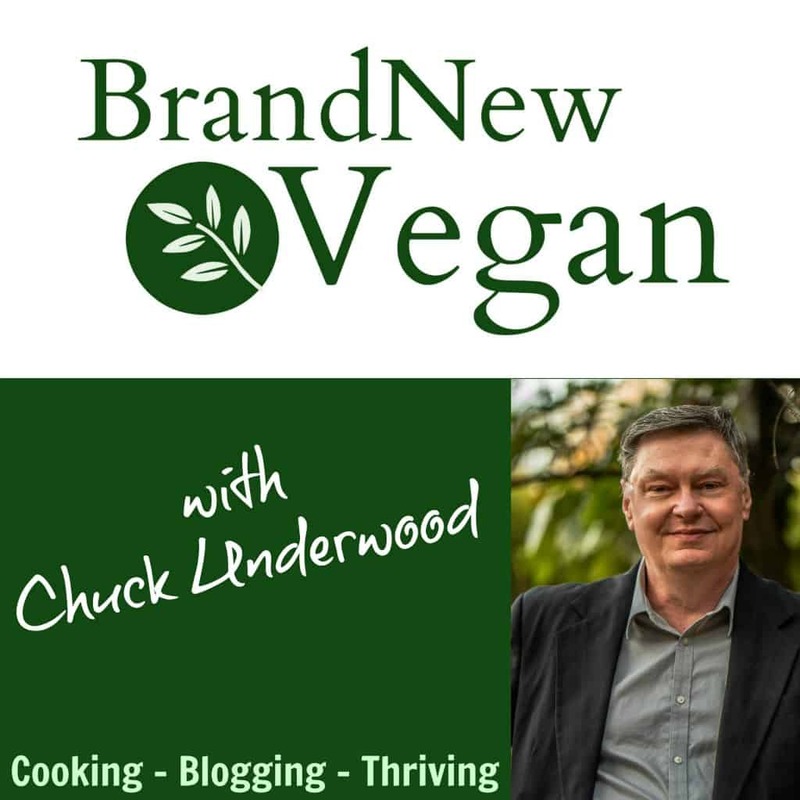 I’m going to try this this week (looking for an easy, delicious bean dish for Christmas). I use that same double-soak method. I think it gets rid of a lot of the gassy effect. Sounding so delicious but 3 cups of dried beans is going to make a huge amount and I am just one old lady on my own. Have you ever frozen these beans after cooking? and how did they fare the freezing process? I’m sure they would freeze well – although I can say I have never done it myself. Bit I believe others have successfully. beans freeze really well. I’m in the same boat as you, so I’ll be freezing some of these, and I’m sure they’ll be fine. Make them frequently for my vegetarian guests and they live them! Oh my…I’ve had the beans in the crock pot for about 4 hours and the smell is wonderful! I pulled out a couple of spoonfuls and I am sure they are going to be a hit at the 4th of July gathering. It did make a large amount, so I’ll be freezing some for camping trips later. I used Chipolte hot sauce because I didn’t have any of the powder. I probably added a good teaspoon, so I hope it’s “zippy” enough! Wonderful recipe! Thank you!! I made these tonight. Started yesterday with the soaking. Noon I had them on simmer on my stove. I don’t have a crockpot. 4pm removed the lid. 6:30pm perfect baked beans. My honey said I could make them anytime! I made only half the recipe, it’s about 6 good sized servings. Thanks for the recipe! Question: I have a rice cooker not a crock pot, will my rice cooker work? How would you cook them in a rice cooker? Thanks! ? 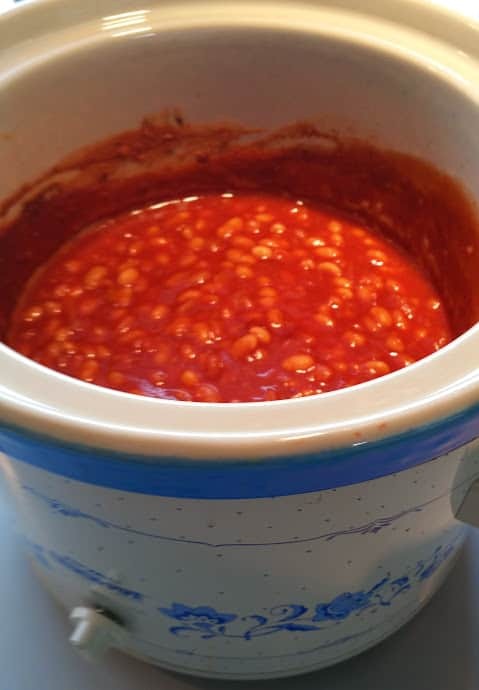 I made them in these baked beans in my Instant Pot for dinner. I used two cans of northern beans, instead of dried beans, and a half cup diced onions instead of a whole onion. And dumped all the ingredients in the Instant Pot. I used the beans/chili button and did a quick release. Next time I’ll use about 1 cup less of the broth. Otherwise, they came out really good. They are not “literally the bomb.” They are figuratively the bomb. If they are literally the bomb, you are an internet terrorist. When do you add the molasses, brown sugar, mustard, and etc.? #11 says add remaining ingredients. Yum. I like to add one or two tsp liquid smoke. Don’t care for even a tiny bit of jalapeño but everything else I have used in baked beans. I did make beans in a real bean pot in the oven a few times. One recipe called for adding apple juice as needed. I was quite surprised that even after adding quite a bit over several hours it didn’t add any flavor at all. Onions completely disappear too, so either add a few more the last hour or stir in some good quality onion powder if you don’t want to chop more onions! When doing the second boil, should the beans be covered again? I covered them for the second boil. These are fabulous! I don’t typically like anything with green bell peppers, but I used it anyway and it’s fantastic! Thank you! Hi, I don’t have a hot pot, can I just cook them slow in my cast iron pot? So many recipes for baked beans and I’m considering trying them all, but in the meantime: “Happy Baked Beans on Toast Day” (25th Dec). A simple peaceful tradition which started a few years ago by one of my adult children. It’s an alternative to the avarice, stress and waste created by mainstream traditions (kept going by films and the media, for retail). How peaceful to enjoy the simple pleasures of life, for to live a simple life, helps others to simply live. Is the mustard powdered or prepared? Thanks! These turned out terrific! You’re right Chuck. These are The Best Dang Baked Beans ever. I was reluctant to make them as I usually listen to the results omitting from my husband for days after! This method takes care of all that and it’s delicious. 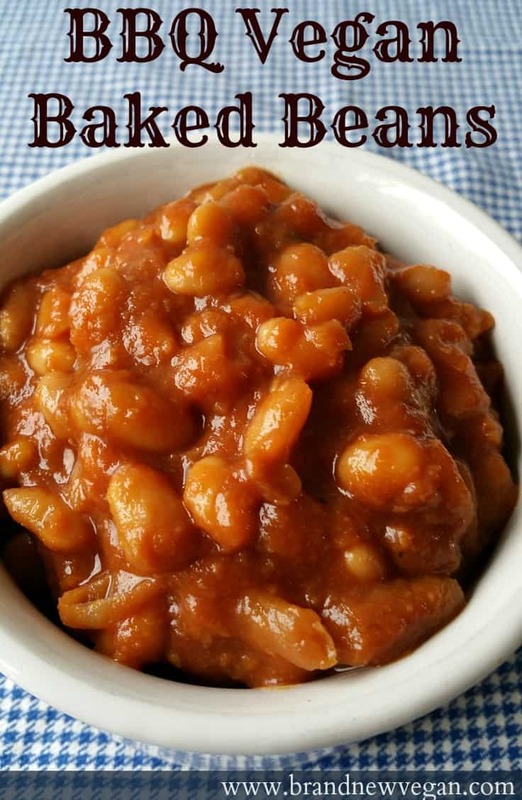 I’m taking these baked beans to yet another pot luck dinner tonight where, like before, I’m sure they will ooohh and awwwe over the taste and then say ‘But I could never be vegan.” ….face palm moment for me. These are so good! And now with nice summer weather…i plan on making them a lot! I am putting the beans on tonight to soak. I can hardly wait to have them for dinner tomorrow night and to take them to our next Pid gathering. I will say thank you at this time, the have to be good! I love your recipes ! I soaked the great northern beans overnight and then the hot soak after and most of the skins came off the beans. Is that ok? Will the beans be mushy? Doubt it. Go ahead and finish cooking them and see. I’ve been making these baked beans for two years. It’s absolutely divine so much so that we eat the leftovers (we usually don’t do left overs. We eat them on the side, and on vegetarian hotdogs. The sequence should follow the recipe exactly however; I add a dash of liquid smoke for a smoky flavor. While slow cooking takes a bit of time, it is not time consuming so I prep and cook other items since it is a common in my summer cookout dinners. How many servings does this make? I need enough for 32. This makes a lot – but not THAT much lol. I would double it for sure – maybe even triple. I made these for Memorial Day and they came out really tasty. As always keep up the excellent creative cooking! Can you serve these beans cold? What size crockpot did you use? I want to double this for 4th of July so I may need a bigger crock pot.